Soon after V.I. Veksler and E. McMillan discovered the stability principle of the motion of particles in cyclic accelerators the Government of our country took up the initiative of academician I.V. Kurchatov with the purpose of developing fundamental research in nuclear physics at high energies and decided in August 1946 to create a special laboratory to be equipped with a powerful accelerator. It was to be established not far from Moscow on the bank of the Volga river near a small village called Novo-Ivan'kovo (subsequently the town of Dubna) at the beginning of the artificial Volga-Moscow channel constructed in 1937 - 38. For reasons of secrecy, the new laboratory, which was a branch of the Moscow institute led by Kurchatov, became known as the "Hydro-technical Laboratory". In those times all establishments that dealt with nuclear physics were classified top secret, and no exclusion was made for the new laboratory. In September 1948 M.G. Mescheryakov was appointed director of the laboratory and I was appointed vice-director. We both held the scientific degrees of Candidates of Physics and Mathematics. The Laboratory was to be based on the largest accelerator in the World, a synchrocyclotron accelerating deuterons up to an energy of 280 MeV, -particles up to 560 MeV and protons up to 460, to start with, and subsequently to 680 MeV. Construction of the edifice proceeded rapidly and in December, 1949 the synchrocyclotron was put into operation. In January, 1950 several groups of physicists from our laboratory and form some Moscow Institutes started research work at the accelerator. In the autumn of 1950 we learned that the well-known Italian physicist Bruno Pontecorvo, a student of the famous Fermi, who came to Moscow from abroad, was to work in our laboratory. Many different legends are told around the world about how Bruno Pontecorvo came to the Soviet Union. About what was the reason for his leaving Europe for the Soviet Union etc. First some words about the reason. This was commented on briefly and correctly by Giorgio Salvini, President of the Italian Academy dei lincei, who in 1994 in Venice presented a talk on the "Legacy of Bruno Pontecorvo": "The case of Bruno, who was a real scientific genius, is quite dramatic, and it is one of the cases combining real scientific comprehension, the force of ideology and even charity toward mankind... Actually, he was convinced in the inspiring and ruling force of communism in the world, like a person believing in his religious "credo". Bruno was an Italian communist, and when he arrived in Russia he soon became member of our Communist Party. His wife Marianne (of Swedish origin), when asked why they came to Russia answered with a foreign accent: "What do you mean by why? To continue building communism". At that time Bruno was a communist-idealist sincerely believing in the strength and rightness of the type of development chosen by Russia. Now, about the actual arrival in Russia. Many cruel lies have been written: in a submarine, on some kind of military ship etc. Nothing of the sort happened. The eldest son Gil, who was 12 years old at the time told me the following. First all the family flew from Rome to Helsinki via Stockholm. Then they went in two cars to Russia's border, and further by train to Leningrad. They stayed for only several days in a hotel, after which they went by train, also, to Moscow. That was in August of 1950. In Moscow Bruno Pontecorvo was presented with a five-room flat with all modern conveniences in a house on Gorky str. (now Tverskaya str.). After three months, at the beginning of November, all the family came to Dubna. In Dubna Bruno settled down in a two-storey cottage on the main street of our scientific town, where identical cottages were occupied by the Director of the laboratory, by me, by the chief engineer and by other leading personnel of the laboratory. Bruno started practically right away to work in the laboratory. The children one after another went to school. The eldest, Gil, graduated from the physical faculty of the Moscow State University (MSU), and since then works in our laboratory. The second son, Tito, graduated from the faculty of geography of the MSU in oceanology, and for some time he worked in expeditions, but then he sharply altered his life plans and not far from Dubna built a horse stable for breeding Akhalteke horses. The youngest son Antonio graduated from the faculty of radioelectronics of the Oil-and-gas institute and works in a computer firm in Moscow. Bruno and the whole family didn't speak Russian, while we all could read English but spoke very badly. This created certain difficulties. However, we were immediately fascinateded by Bruno's outward charm and manners. We in Russia are used to address each other by our name and patronymic, and since we were actually coevals with Bruno (I was his age, while Mescheryakov was only three years older) we were felt it embarassing to call him only by name. As to the young researchers, they just thought it impossible. Therefore during our first meeting I asked Bruno the name of his father. He said Massimo. We then agreed to call him Bruno Maximovich. ever since those faraway years he was known in scientific and social circles of Russia as Bruno Maximovich Pontecorvo. At that time Bruno Pontecorvo was quite well known in the world scientific community of nuclear physicists as a talented scientist. He participated in the 30-ies in E. Fermi's famous studies of the slowing down of neutrons. We knew his works on nuclear isomery carried out in the group of Joliot-Curie in Paris. He was well-known as the scientist who first established that the muon decays into an electron, but without emission of a photon; as the physicist who proposed a remarkable radio-chemical chlorine-argon method for detecting solar and reactor neutrinos, and, also, as the author of the hypothesis, first put forward in 1947, of the universality of the weak interaction of the electron and of the muon with nucleons. All this testified that Bruno Pontecorvo possessed an extremely fruitful combination of the gift of being capable of penetrating profoundly into the essence of physical phenomena and the remarkable abilities of a refined experimenter. That such a talented and well-known scientist was to work in the then small scientific community of our laboratory was very valuable. During the discussion of his scientific work in Dubna for the nearest years, Bruno expressed his wish to work on the investigation of the interaction of negative pions with nuclei, the production of neutral pions in nucleon-nucleon collisions and to study processes of elastic pion-nucleon scattering. In a short time a group comprising several young researchers, engineers and laboratory assistants was set up, and under his leadership they starting designing equipment and performing experiments in the beams of the accelerator. However, the scientific interests of Bruno Pontecorvo were very wide-ranged and went beyond the adopted program. He read the scientific literature very carefully, including literature on the production of new particles. In 1951, upon having analysed available experimental results on the production of hyperons and heavy mesons and having revealed a sharp incomprehensible disagreement between their significant production probability and their relatively long lifetimes of 10-9 - 10-10sec, he formulated, independently of A. Pais, the hypothesis of associated production of hyperons and heavy mesons in the strong interaction. With the purpose of testing this hypothesis, the group of B.M. Pontecorvo carried out a special experiment at our accelerator in search of events of -hyperon single production and, indeed, found none. Later, the validity of the Pontecorvo-Pais hypothesis was confirmed in experiments at the cosmotron, where the simultaneous production of 0-particles and K0-mesons and of --particles and K+-mesons in - p interactions was observed. All these facts resulted in the introduction of the new concept of "strangeness", which became a new quantum number dividing elementary particles into ordinary and strange particles. The year of 1956 was when the Joint Institute for nuclear research was founded in Dubna. I was appointed Director of the Laboratory of nuclear problems of this Institute, and Bruno was Head of a sector in this laboratory. The 680 MeV synchrocyclotron remained the base installation of the new Laboratory. My personal contacts with Bruno became more frequent and more close. In 1957 Bruno Pontecorvo presented a short report at a seminar in which he spoke of his new idea concerning the possibility for one type of neutrinos transforming into another by analogy with the oscillations of neutral kaons. This phenomenon can be realized only if the neutrinos have non-zero masses. At that time the idea of neutrino oscillations was extremely audacious and was apprehended by many as the fantasy of a prominent physicist. At present, tens of laboratories are involved in searches of this phenomenon, considering it to be related to effects lying beyond the standard theory. It is not to be excluded that precisely this phenomenon explains the observed lack in the neutrino flux from the Sun as compared with the expected flux calculated on the basis of the standard model. Moreover, the observation of neutrino oscillations would also be important because it would permit determining the difference between the masses of the various types of neutrinos. During many years, and actually until his very death, Bruno Pontecorvo, together with S.M. Bilenky, elaborated the problem of neutrino oscillations. The year of 1959 was marked by two new remarkable ideas of Bruno. One of them postulated the existence of a muon neutrino differing from the neutrinos emitted in the usual -decay of nuclei, and Bruno also proposed and designed an experiment for the identification of this new type of neutrinos at a powerful accelerator. Bruno presented this proposal in his report to the 1959 Rochester conferenece, which was held in Kiev. Such an experiment was indeed carried out in 1962 at Brookhaven, and its results (the discovery of the muon neutrino) brought the Nobel prize to three American physicists: L. Lederman, M. Schwartz, and J. Steinberger. This idea of B. Pontecorvo turned out to be the key that opened up the way to the large-scale development of neutrino experiments at high-energy accelerators. The second of Bruno's ideas put forward in 1959 is related to a totally different field of knowledge, to astrophysics. Such was the hypothesis concerning the possible existence of lepton bremsstrahlung (the production of neutrino pairs in collisions of fast electrons with nuclei). This process may also take place at certain stages of the evolution of stars and play an important part in the energy balance of the Universe. Bruno actively discussed the theoretical aspects of this problem with Ya.A. Smorodinsky. Their discussions resulted in a joint article entitled "Neutrinos and the density of matter in the Universe" (1961). It must be noted that B. Pontecorvo interacted systematically and very intensely with theorists. He published a significant number of papers on important problems in particle physics together with V.N. Gribov, L.B. Okun, S.S. Gershtein, S.M. Bilenky and others. All his life, Bruno was especially inspired by fundamental problems of weak interactions, on which he worked very intensively. Most likely, he was the first who applied general theoretical arguments in examining such a weak process as the capture of a negative muon by a proton with the purpose of extracting from the appropriate experiment information on the weak interaction constants. However, this approach was complicated by the existence of various mesoatomic and mesomolecular processes taking place in hydrogen, so it required thorough preliminary investigation of these processes. Therefore Bruno chose another method, and in 1961-62, together with R.M. Sulyaev and others, he carried out an experimental study of the capture of negative muons in helium-3, in which, like in p µ-capture, the proton is transformed into a neutron. The experimental device chosen was a diffusion cloud chamber filled with helium-3 and thoroughly cleaned from tritium (down to an atomic fraction of 10-15). This device was the judge, as Rutherford called the Wilson cloud chamber. It served simultaneously as a target and a track detector. It was in these experiments that the signature of the muon neutrino was first seen, and it was observed as the recoil 3H nucleus departing from the vertex of the muon capture in helium-3. The authors succeeded in: 1) measuring the reaction rate (µ3He 3H+ µ), which turned out to be =(1.41+0.14) 103sec-1. The result was in very good agreement with the predictions of the universal weak interaction theory, in accordance with which =(1.56+0.06) 103sec-1, and thus it confirmed Bruno's initial hypothesis concerning the muon-electron symmetry in weak interaction processes involving nucleons; and 2) imposing a limit on the muon neutrino mass which at the time was quite low (Mvµ<8MeV/c ). In 1968 Bruno Maximovich told me he had decided to translate the scientific works of E. Fermi into Russian. I supported this valuable idea very enthusiatically and helped resolve organizational issues. Owing to the enthusiasm of Bruno and of the staff of the laboratory who worked with him, the works of Fermi were translated in 1971 and published in the Russian language in 2 volumes of the series "Classics of science" together with a very good introductory article and comments written by Bruno. We were all fascinated by the outstanding talent and enormous creative capabilities of the genius - of Bruno Pontecorvo, by his ability to reveal new phenomena, to see similar features in apparently totally different processes and to make far-reaching generalizations. Thus, in this connection, we, friends and colleagues of Bruno Maximovich, presented him on the occasion of his 80-th birthday with a jubilee address, which among others contained the following words: "General admiration is aroused by the capability of Bruno Maximovich to generate profound ideas in all sectors of physics that draw his attention and to point to ways of their realization". A good illustration of the above is presented by all his works mentioned above. But, here, is another unexpected and brilliant illustration of Bruno Pontecorvo's mighty talent. Over 30 years ago, in 1956, half a year after the discovery of the antiproton by E. Segre and others, he published an article in which he pointed to the possibility of exotic reactions of antiproton annihilation on a single nucleon, but permitted only when the antiproton undergoes annihilation on a nucleus. Experimental investigation of these processes, that were termed Pontecorvo reactions, actually became possible only after 30 years owing to a storage ring of low-energy antiprotons (LEAR) being put into operation at CERN. It turned out that there was here a whole new hitherto untouched branch of nuclear physics to be dealt with. And now a group of scientists of our laboratory led by M.G. Sapozhnikov has been for several years successfully studying, together with Italian and other physicists, new reactions with the OBELIX detector at CERN and obtaining results of high scientific value. Bruno Maximovich Pontecorvo, who worked for most of his life in Russia, was the pride and bright star of Italian, Russian and world nuclear physics. In 1958 he was elected corresponding member of the USSR Academy of sciences; in 1964 he became academician. He won State prizes and the Lenin Prize for his scientific achievements and activities in the organization of science, he was awarded many of the highest USSR orders. For many years Bruno Pontecorvo was professor of the Moscow State University, he held the chair of elementary particle physics and brought up large group of young scientists. He headed the Scientific Council for neutrino physics at the Academy. He was the neutrino "Pope" in our country. All significant projects in neutrino physics were discussed at B. Pontecorvo's Council. Anyone who intended to initiate experiments in neutrino physics came to him for advice. His scientific prestige was very high, and his call for scientific work to meet high-level requirements was very strong. All this combined with profound benevolence and generosity with ideas. Regretfully, the life and activities of Bruno Pontecorvo in our country were darkened for a long time by his being deprived of the right to travel abroad. Only my efforts as Director of the laboratory and several appeals of the Institute's Directorate to the Academy of Sciences and to the highest State authorities resulted in his being allowed in 1959 to travel abroad, but only in JINR member states. Starting from 1959 he visited China, Bolgaria, Hungary (several times), East Germany, Czechoslovakia, Poland, Romania, Mongolia. It being impossible to visit his native country, to participate in International conferences held in Western countries, the USA, Japan etc. depressed him very strongly. Bruno Pontecorvo in principle could not stand and was outspokenly critical of any kind of limitation of personal freedom. It was, therefore, no chance that during the period of political persecution of academician A.D. Sakharov he categorically refused to put his signature under the letter denouncing Sakharov's ideas on the necessity of fundamental changes in the USSR state policy and signed by many members of the USSR Academy of Sciences. The first time Bruno Maximovich was granted permission to visit Italy was only in 1978. By then he already had the first symptoms of Parkinson's disease. Starting from 1980 he nearly every year (sometimes twice a year) went to Italy, where he underwent treatment for periods from one up to 3 months long. From Italy he used to go to Switzerland and France. When he was in Italy, Bruno Maximovich could take part in a whole series of international conferences and workshops on the problems of modern elementary particle physics, which were held in Italy, France, Spain, and Switzerland. The last time he returned to Russia from Italy on July 20, 1993. His 80-th birthday was celebrated in the Institute on August 22, 1993. However, at the end of August the health of Bruno Maximovich started to deteriorate sharply, and on September 24 of 1993 he passed away. I learned of this painful, bitter, and unacceptable loss on September 25, coming out of the Sheremetievo airport of Moscow upon arrival from an international conference held in Japan. I was stunned by the sad news. The last time we met was on September 16, at his home, when I came to see him just before my flight to Japan. He was in bed, but still felt relatively well and smiled a farewell. My study at the Institute was practically opposite Bruno's study. During the 43 years Bruno lived in Dubna we were friends. He supported me very much in my difficult many-faceted work of Director of our laboratory, a position which I held for 32 years starting from 1956. It is difficult to overestimate Bruno's contribution to creating, in our laboratory and Institute, an atmosphere of exacting a high level from scientific works and of benevolently demanding discussions of new experimental and theoretical results. He greatly influenced the formation of sectors of investigation in our laboratory, in JINR as a whole, in IHEP (Protvino), in the Department of nuclear physics of the Academy of Sciences. A whole group of talented physicists grew up in the laboratory under his direct guidance. This group comprises professors V.G. Zinov, S.M. Korenchenko, G.V. Mitselmakher, L.L. Nemenov, A.I. Mukhin, V.A. Zhukov and others, who came to his department upon graduating from Institutions of Higher Education. In spite of his extremely grave illness, Bruno Maximovich retained a clear mind till the end of his life, his brain worked tirelessly and fruitfully. Physics was life for Bruno Pontecorvo. But at the same time he was a person of considerable and deep culture: he loved theatre, art, architecture. He was keen on various kinds of sport: he was an excellent tennis-player - his game was fine and inventive; he drove a car skillfully; he liked to ride a bicycle and to show various tricks on it. Bruno possessed a fine sense of humor. He liked to joke and to show tricks. He was best at balancing a stick on the tip of his shoe, or on his little finger, or on his nose. He liked to show how pieces of chocolate dance in a glass of champagne. On vacation he often went to the Black sea, to Crimea, to stay at Koktebel or Foros in the company of scientists, artist friends or cinema directors. He was keen on underwater fishing, and would swim for hours in a Calypso suit with his mask on. 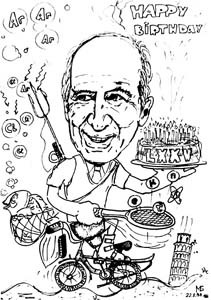 The many facets of Bruno Pontecorvo's hobbies - scientific and others - have been reflected very truthfully and with talent in a cartoon by Misha Bilenky (the son of Prof. S. Bilenky). This drawing was presented to Bruno on his 75-th birthday. The radiant image of Bruno Maximovich Pontecorvo, a genius in science and an outstanding personality will remain in the hearts of many and many people who were lucky to work and to communicate with him. He merits eternal acknowledgement of his scientific achievements and profound respect in the whole scientific world.